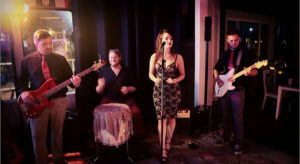 Black Water is a local Blues and Soul band featuring Kelly O’Neill singing lead with Andre Carrao on guitar, San Ryan on bass and Rudger Wagner on drums. Simply a wonderful band. Kelly’s voice is strong yet sultry and warm and compassionate. The trio of musicians backing her are outstanding. They are a pleasure to hear – your hears will thank you. Super professional group destine for a very bright future!